Biomass burning aerosol (BBA) exerts a considerable impact on regional radiation budgets as it significantly perturbs the surface fluxes and atmospheric heating rates and its cloud nucleating (CCN) properties perturb cloud microphysics and hence affect cloud radiative properties, precipitation and cloud lifetime. It is likely that such large influences on heating rates and CCN will affect regional weather predictions in addition to climatic changes. Amazonia is one of the most important biomass burning regions in the world, being significantly impacted by intense biomass burning during the dry season leading to highly turbid conditions, and is therefore a key environment for quantifying these processes and determining the influence of these interactions on the weather and climate of the region. assess the impact of .biomass burning on the Amazonian biosphere. The main field experiment was based in Porto Velho, Brazil and investigated the dry season and onset of the wet season. The UK large research aircraft (FAAM) sampled aerosol chemical, physical and optical properties and gas phase precursor concentrations. Measurements of radiation were also made using advanced radiometers on board the aircraft and satellite data are also being used. 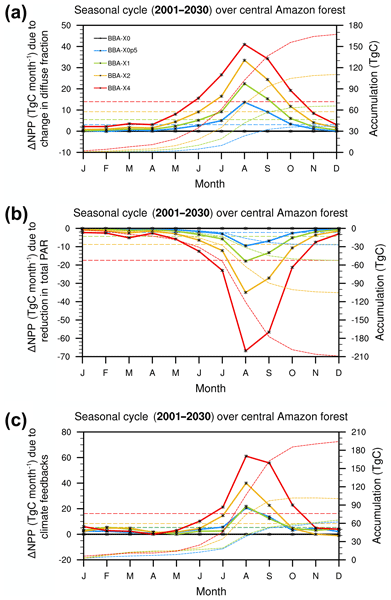 The influences of biomass burning aerosols are highly significant at local, weather, seasonal, and climate temporal scales necessitating the use of a hierarchy of models to establish and test key processes and quantify impacts. The study is challenging models carrying detailed process descriptions of biomass burning aerosols with the new, comprehensive observations being made during SAMBBA to evaluate model performance and to improve parameterisations. Numerical Weather Prediction and Climate model simulations with a range of complexity and spatial resolution are being used to investigate the ways in which absorbing aerosol may influence dynamics and climate on regional and wider scales. At the heart of the approach is the use of a new range of models that can investigate such interactions using coupled descriptions of aerosols and clouds to fully investigate feedbacks at spatial scales that are sufficiently well resolved to assess such processes. 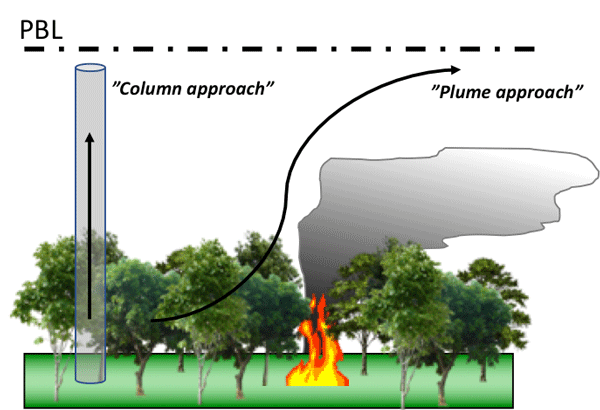 We use a global aerosol model with observations to improve model representation of aerosol emissions from fires in the Amazon. We find that observed aerosol concentrations are captured by the model over deforestation fires in the western Amazon, but underestimated over savannah fires in the eastern Amazon. The model underestimates observed aerosol optical depth (AOD) even when the observed aerosol vertical profile is reproduced. We suggest this may be due to uncertainties in the AOD calculation. 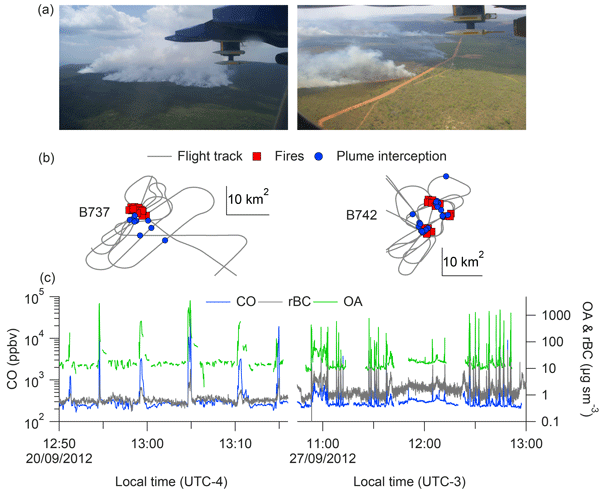 We flew a large atmospheric research aircraft across a number of different biomass burning environments in the Amazon Basin in September and October 2012. In this paper, we focus on smoke sampled very close to fresh fires (only 600–900 m above the fires and smoke that was 4–6 min old) to examine the chemical components that make up the smoke and their abundance. We found substantial differences in the emitted smoke that are due to the fuel type and combustion processes driving the fires. Biomass burning is a large source of carbonaceous aerosols, which scatter and absorb solar radiation, and modify cloud properties. We evaluate the simulation of biomass burning aerosol processes and properties in the HadGEM3 climate model using observations, including those from the South American Biomass Burning Analysis. We find that modelled aerosol optical depths are underestimated unless aerosol emissions (Global Fire Emission Database v3) are increased by a factor of 1.6–2.0. We use a global aerosol model evaluated against long-term observations of surface aerosol and aerosol optical depth (AOD) to better understand the impacts of biomass burning on tropical aerosol. We use three satellite-derived fire emission datasets in the model, identifying regions where these datasets capture observations and where emissions are likely to be underestimated. For coincident observations of surface aerosol and AOD, model underestimation of AOD is greater than of surface aerosol. Fires associated with land use and land cover changes release large amounts of aerosols and trace gases into the atmosphere. Although several inventories of biomass burning emissions cover Brazil, there are still considerable uncertainties and differences among them. However, results indicate that emission derived via similar methods tend to agree with one other, but aerosol emissions from fires with particularly high biomass consumption still lead to an underestimation. 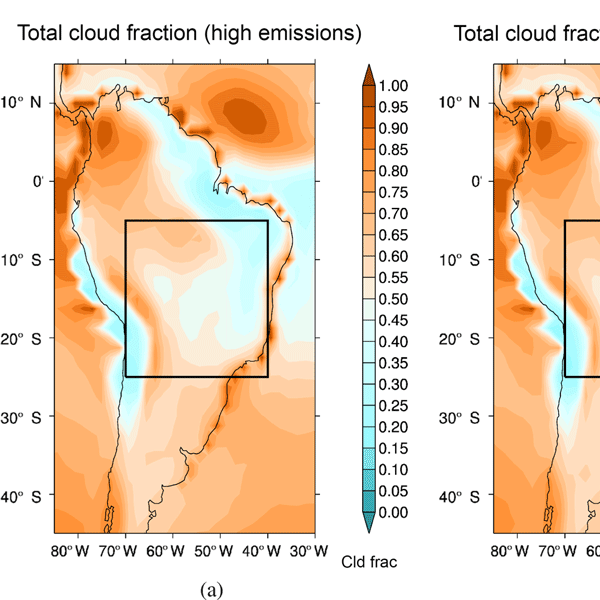 The response of the Weather Research and Forecasting model with Chemistry to forcings by biomass burning aerosol were investigated in high-resolution nested domains over Brazil. The aerosol-layer was found to have a negative direct effect at the top of the atmosphere, but this was largely cancelled by a semi-direct effect which inhibited afternoon cloud formation. The cloud response to the aerosol was found to be highly sensitive to model resolution and the use of convective parameterisation. A widespread and persistent smoke layer was observed in the Amazon region during the biomass burning season, spanning a distance of 2200 km and a period of 14 days. The larger smoke content was typically found in elevated layers, from 1–1.5 km to 4–6 km. Measurements have been compared to model predictions, and the latter were able to reproduce the general features of the smoke layer, but with some differences which are analysed and described in the paper.